First responders in Coquitlam, B.C., used a special mask to ensure a 9-year-old shih tzu wasn't overcome by smoke after it was rescued from a house fire early Wednesday morning. The residents of a house in the 2100-block of Craigen Avenue were able to escape the smoke and flames — which broke just after 1 a.m. — with one of their pet dogs, but another, Mimi, was still trapped inside. Firefighters arrived at the house to find smoke and flames shooting outside, according to Assistant Chief Gary Mulligan with Coquitlam Fire and Rescue. "Crews arrived, found flames on the rear of the house, licking up the side of the house," said Mulligan, adding that the fire seems to have started in the basement suite's kitchen area. Firefighters were able to find the shih tzu in distress and bring it out to safety. "It had a very weak pulse and it was having troubles breathing. So we have a special pet rescue kit on our rescue trucks. 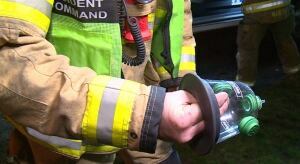 Crews deployed that right away and started giving the dog oxygen." Coquitlam mayor Richard Stewart happens to live around the corner from the house that caught fire. When he heard the commotion, he got dressed and went outside to see what was going on. "This was quite an experience to be able to watch firefighters and paramedics both working that diligently to save an animal," said Stewart. "I was quite touched by that moment. It was quite important." Paramedics with the B.C. Ambulance Service then loaded the small dog into an ambulance and brought it to a 24-hour animal hospital. 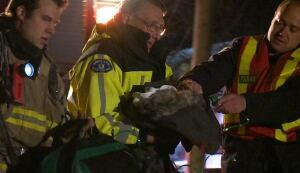 One paramedic, who declined to give his name, said that's the first time he had seen an animal transported by ambulance in his 30-year career. Both Mulligan and Stewart confirmed that it was a first for them, too. Mulligan said there was significant damage to the downstairs suite, as well as smoke damage upstairs. He said it would likely be a week before the residents — and their pets — would be able to move back into the home. A fire investigator will work to determine the cause of the fire.